Last month I came across a design for ornaments that I really liked. 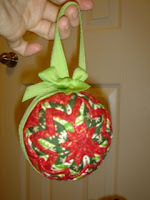 It's called a quilted ornament. It doesn't require any sewing, just folding and pinning fabric squares in a pattern, and I think it makes the cutest little decorations! Here are some pics of one of my recent projects. 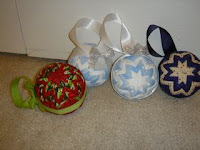 If you are interested in purchasing a pattern to make these ornaments visit Simple Beans through my link(s) to the left. It takes about an hour to complete one after you get the hang of it, and I find it to be totally relaxing!